This tutorial explains how to split panorama image into smaller sections. There is a freeware known as PictureClip, that I will use in this tutorial. 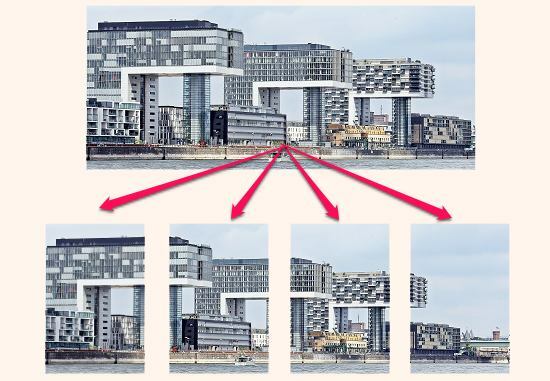 The software takes a panorama image from you and then lets you draw vertical and horizontal reference lines over it. After that, you can split the panorama image according to the sections you have drawn. Also, you can use the built-in feature of the software to divide the image into equal horizontal or vertical sections. 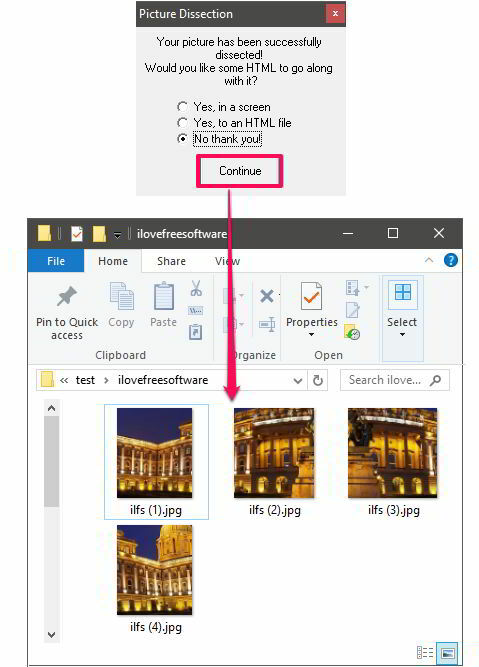 You can export the images that it has split into BMP or JPEG files to any folder you like. 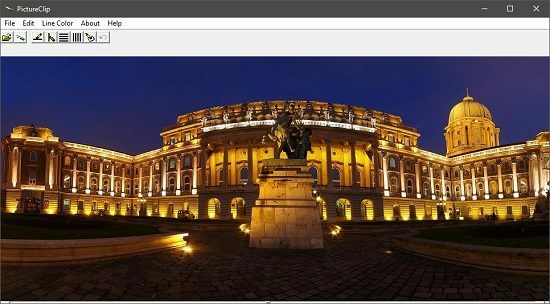 Since panorama images are quite large in dimensions and can normally be viewed by special panorama image viewers only, so if you want to divide a panoramic photo into various parts, then the software that I have mentioned here will be helpful. PictureClip freeware makes it very simple to cut out panoramic or any image in smaller pieces. You just have to draw reference lines on the source image and it will split that image accordingly. After splitting images using PictureClip, you can also stitch them back. There are some panorama stitcher software available to do that. How to Split Panorama Image into Smaller Pieces? PictureClip freeware lets you split image very easily. The reference lines that you draw over a source image can be drawn equally by the software. Or, you can also draw lines anywhere on the image you want. And not only horizontal or vertical lines, but you can also draw both lines together to make grids over the image. You can choose different colors for the reference lines. And the software will cut out the images for you accordingly. PictureClip also lets you create an HTML file by including the split images. When you open that HTML file in the browser, you will see a complete panorama image (stitched). Step 1: Open the software and then load a panorama image in it. Use the Open File button from the toolbar to it. Create Sections: When you have drawn all the reference lines, you can click on this button to start the splitting process. Draw Horizontal Lines: This tool will let you draw horizontal lines over the source panorama image. You can click anywhere on the image and it will draw a line there. Draw Vertical Lines: This tool will let you draw the vertical lines over any part of the image. When you click on any point after selecting this tool, there will be a vertical line drawn. Divide Horizontally Equal: Use this tool to divide the panorama image into equal horizontal sections. After you choose this tool, it will ask you to enter the number of sections you want. Divide Vertically Equal: This tool will let you divide the panorama image into vertically equal parts. Just choose this tool and then specify the number of parts you want. Clear Lines: You can use this tool to clear all the reference lines that you have drawn so far. Undo: If you made mistake during the reference lines drawing process, then you can always undo the operation. Use this button to undo the last operation you did. In the software, Ctrl+Z shortcut will not work for undoing. Step 3: After you have drawn the lines, simply hit the Create Section button from the toolbar. It will ask you where you want to save the image and also you will have to type a prefix name from the split images. Step 4: Next, it will ask you whether you want to create an HTML file. Choose the options as you want and then hit the Continue button. Your panorama will be split and you will see all the split parts in the target folder. In the same way, you can split other panorama images easily. PictureClip is a very simple software to split panorama image. 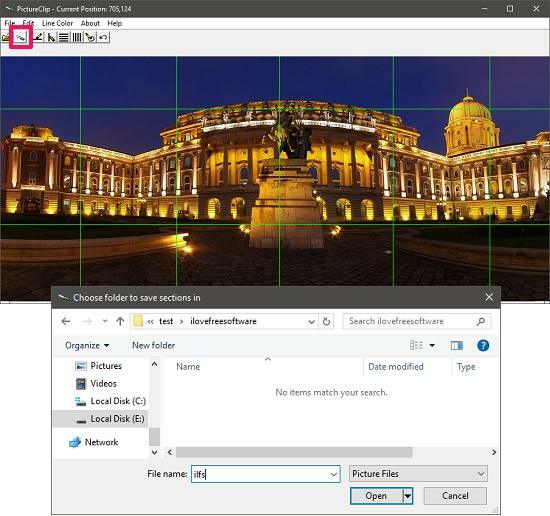 I like the features that it offers to split panorama image using reference vertical, horizontal lines and reference grids.